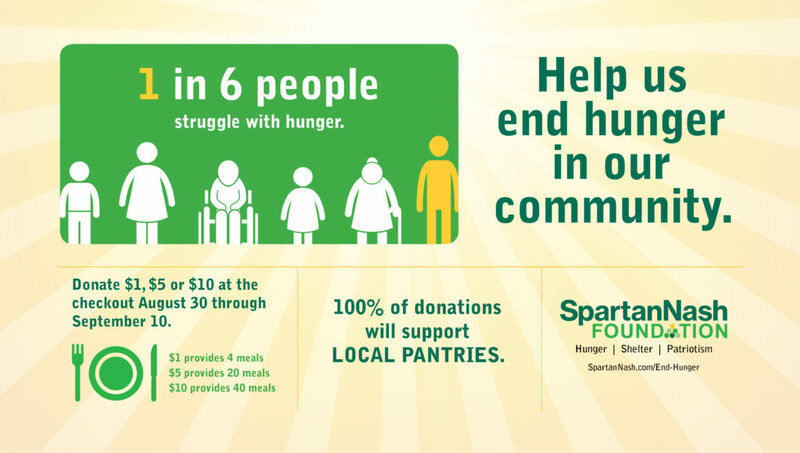 GRAND RAPIDS, Mich. – The SpartanNash Foundation is hosting a companywide fundraising effort to help end hunger in the communities it serves, inviting store guests to join the Foundation and SpartanNash associates in supporting local food pantries and food banks. The retail scan campaign runs Aug. 30-Sept. 10, and 100 percent of dollars raised will support community food pantries selected by each of SpartanNash’s corporate-owned stores in eight states. During the companywide fundraising campaign, customers who visit any SpartanNash-owned retail store or fuel center in eight states will have the opportunity to donate $1, $5 or $10 at any checkout lane. When customers make a donation during the 12-day scan, they will receive four coupons toward Spartan® or Our Family ® brand products. The hunger scan is the fourth scan campaign the SpartanNash Foundation will execute in 2017. To date, nearly $785,000 has been raised through the generosity of store guests and funds contributed by SpartanNash and the SpartanNash Foundation, benefitting local Special Olympics, Habitat for Humanity and patriotic partners. In 2016, $294,350 was donated to local food pantry partners through the retail scan campaign to provide hunger relief.